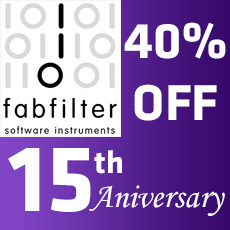 FabFilter celebrates it's 15th anniversary with 40% discount on everything until end of April! FabFilter Volcano has proven to be one of the few plug-ins that offer convincing high quality digital filtering with unique analog character. With tons of features, modulation options and a unique user interface, Volcano 2 is the absolute top of its class! With Volcano 2, FabFilter takes interface design to a whole new level. The innovative what-you-use-is-what-you-see concept shows only what you are actually using, making it a breeze to work with the impressive list of features that the plug-in has to offer. With all the XLFOs, envelope generators, envelope followers and MIDI sources you will ever need, Volcano 2 offers endless modulation possibilities. Setting up new modulation connections is easy with the drag-and-drop modulation matrix. For a Free 30-day trial Version please go to "More Infos".